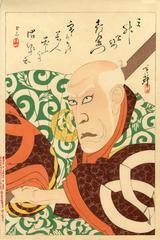 So far, we know of twenty-seven prints in this series devoted to the performances of Ichikawa Danjūrō IX. "Ōkubo Hikozaëmon was the favourite minister and adviser of the Shogun Iyemitso. Numberless stories of hit sagacity and kindness are recorded in popular literature; and in many dramas the notable incidents of his official career are still represented." Quoted from a footnote on page 109 of Kotto: Being Japanese Curios, with Sundry Cobwebs by Lafcadio Hearn. "Ōkubo Tadanori, 忠教 (1560-1639). 8th son of Tadakazu, better known by the name of Hikozaemon, accompanied his elder brother Tadayo in his campaigns, and was involved in the disgrace of his nephew Tadachika. After the siege of Ōsaka (1615), Ieyasu offered to restore his domains, but Tadanori refused to accept them. However, he remained at Edo and became the councillor and confidant of the Shōgun Hidetada and Iemitsu." Quoted from: Historical and Geographical Dictionary of Japan by E. Papinot, p. 482.